Ar is often detected in samples after argon ion sputtering, e.g. during a depth profile. It is more likely to be detected when using higher energy beams as this leads to implantation. At lower beam energies, the argon escapes through defects and damage in the crystal structure. Confirm assignment using Ar2s peak at 319 eV. This may be a difference in work function rather than a true chemical shift. Ar2p peak has clearly spaced spin-orbit components (Δ=2.2eV, intensity ratio=0.512). 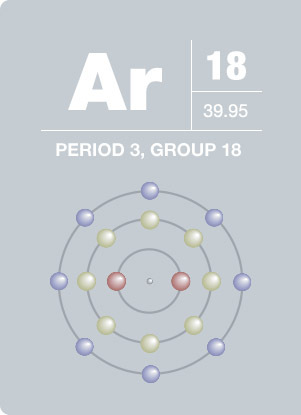 Argon was discovered in 1894 by Lord Rayleigh and Sir William Ramsay, although Henry Cavendish suspected its existence over one hundred years earlier. This noble gas is chemically inert, and is colorless and odorless in its liquid and gaseous forms. Argon makes up slightly less than 1% of the Earth’s atmosphere. There are no known stable chemical compounds containing argon. Due to its inert nature, argon is used in lighting, as a blanket in the manufacture of titanium, and in other applications needing a nonreactive medium.